In this weeks 'would be' haftora (the standard haftora for Parshas Shmini, however this week is Parshas Purrah, so we read a different section) King David dances with all his might and with all types of technique and style in honor of the holy Ark ["which is called the Name Name God of Hosts..."]. The Queen, Michal the daughter of King Shaul felt that this was inappropriate and degrading conduct for a King of Israel, and King Duvid told her that God chose him over her father Shaul and this is how he conducts himself, and on the contrary even if he were to be more light-headed, and hold himself even lower, it would be worth while earning the respect of the maidservants, celebrating before God! The prophet says that Michal was punished and she didn't have children. (as R' Shlomo Carlbach probably would say, how can someone incapable of appreciating being free and innocent bring children into the world?!). This is a classic demonstration of the true path of the Nanach, dancing on the street and rejoicing with straightforward simplicity in the light of God. Some claim that this is G"f a desecration of the honor of Judaism, and they punish only themselves with this judgement, for they will never bear true progeny R"L. God already revealed to us His appreciation! 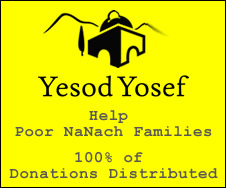 Right after I wrote this I was reviewing previous posts and I found that I had already wrote about this in 2009 B"H, here's the link: Nanach - The Way to Eretz Yisroel! It says in the posuk; Ad Yom Mosah. But on the day she died, she had a kid.